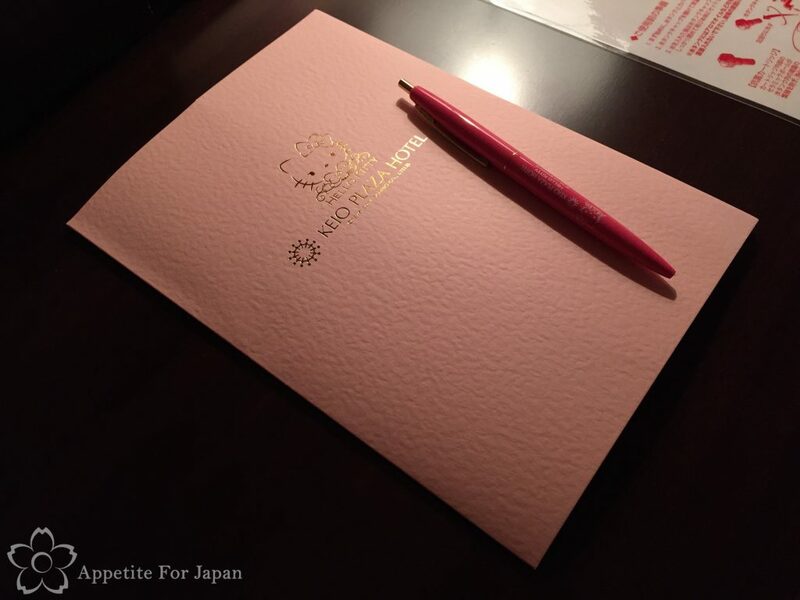 Keio Plaza Hotel is a large Japanese hotel chain, with its flagship hotel in Shinjuku. The massive Keio Plaza Tokyo Hotel was built in 1971 as the first sky-scraper in Nishi-Shinjuku, and it was Japan’s first high-rise hotel. If the name Keio sounds familiar to you and you’ve visited Japan before, it’s probably because you’ve come across the Keio train line. Yes, these are part of the same corporation. Keio Plaza Hotel Tokyo is often referred to as Keio Plaza Hotel Shinjuku (京王プラザホテル 新宿). 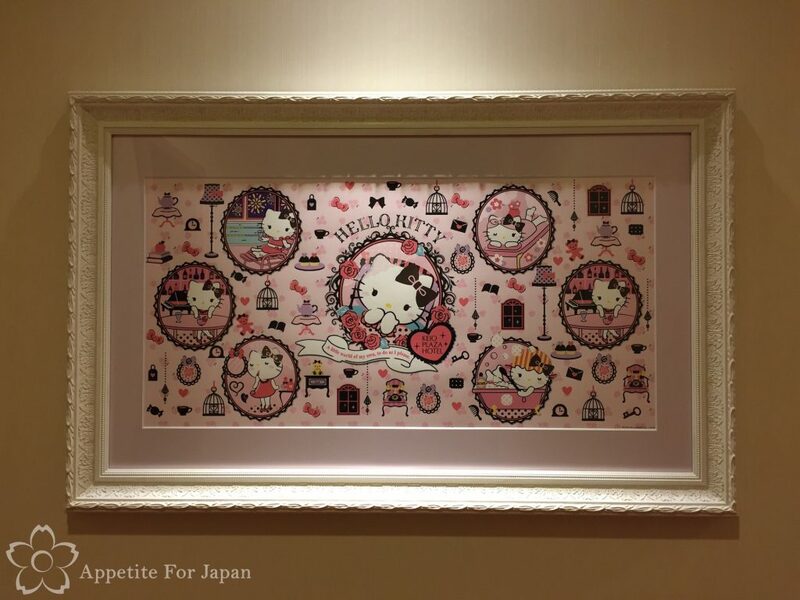 Keio Plaza Hotel Tokyo has 1450 rooms and, as of 2014 – Hello Kitty’s 40th anniversary – these include eight Hello Kitty (ハローキティ) themed rooms (four Princess Kitty rooms and four Kitty Town rooms). 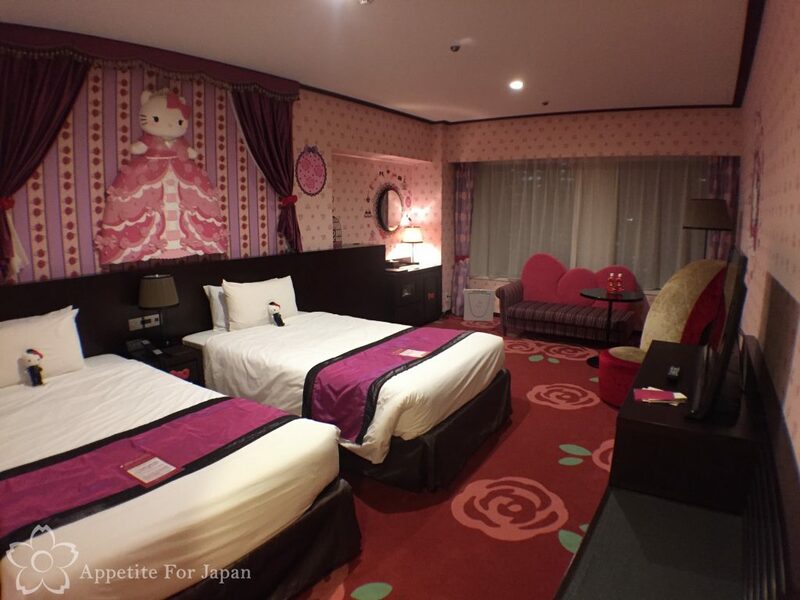 The Tama branch of Keio Plaza Hotel also has four Hello Kitty rooms, and these are perfect for serious Hello Kitty fans paying a visit to Sanrio Puroland in the same suburb. We visited Sanrio Puroland the day after our stay in the Hello Kitty room, but we chose the Shinjuku branch over the conveniently located Tama accommodation, because whilst both hotels have the bright, fun Kitty Town rooms, the Princess Kitty rooms are exclusive to Keio Plaza Tokyo in Shinjuku… and I just had to stay in a Princess Kitty room (プリンセスキティルーム )! Without further ado, let’s check out the hotel! 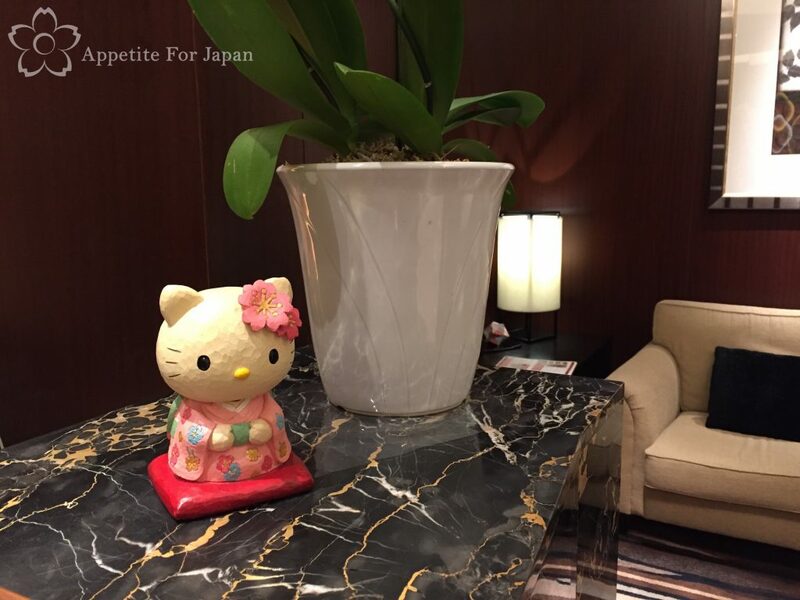 Guests staying at Keio Plaza Shinjuku’s Hello Kitty rooms get to skip the queues and check in at the Premier Counter. Once we’d completed the formalities, a staff member took us to our room. Even though we only had backpacks, the staff member carried these to our room for us! 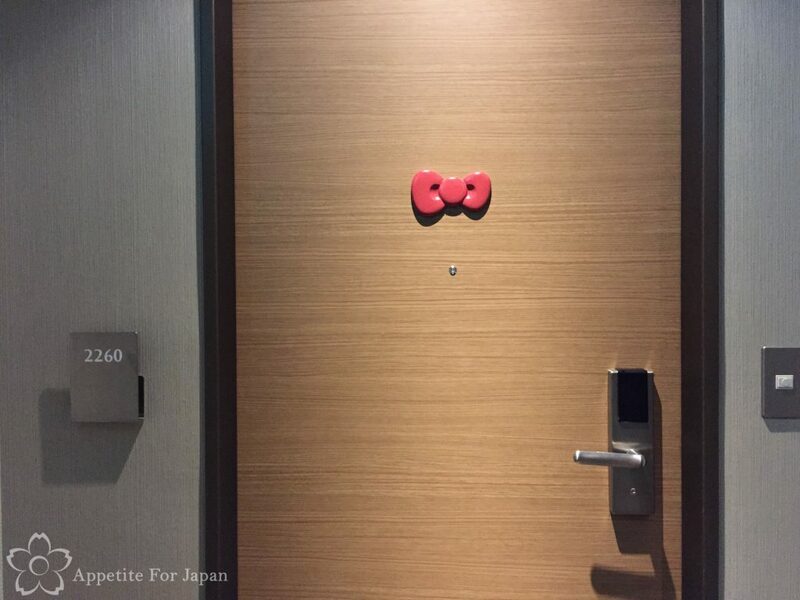 Above: Hello Kitty rooms can be spotted by the bow on the door! 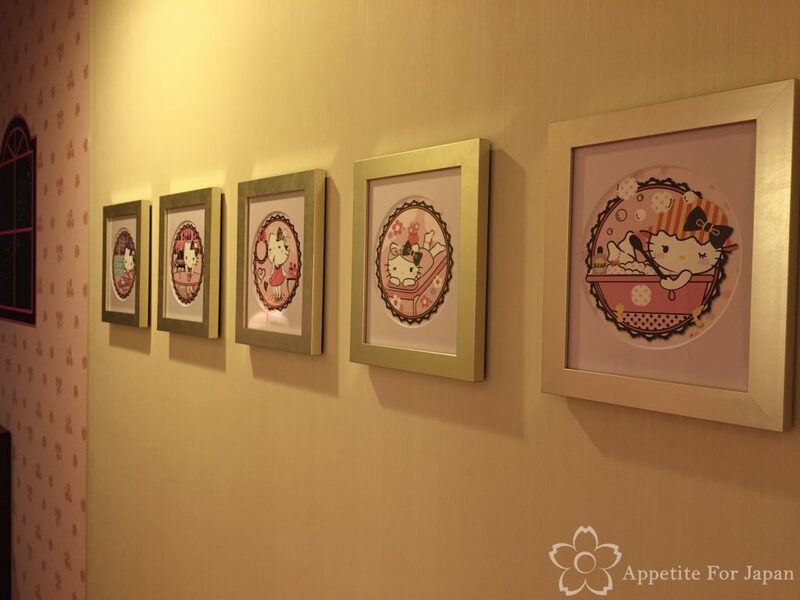 These rooms are fully decked out in Hello Kitty style, and as soon as you open the door, you’ll find a fancy framed picture of Lady Kitty (did you know that that’s Hello Kitty’s actual name?) going about her daily routine. Above: More framed pictures of Lady Kitty being pampered line the wall to the main room. And here it is! The incredible Princess Kitty room! 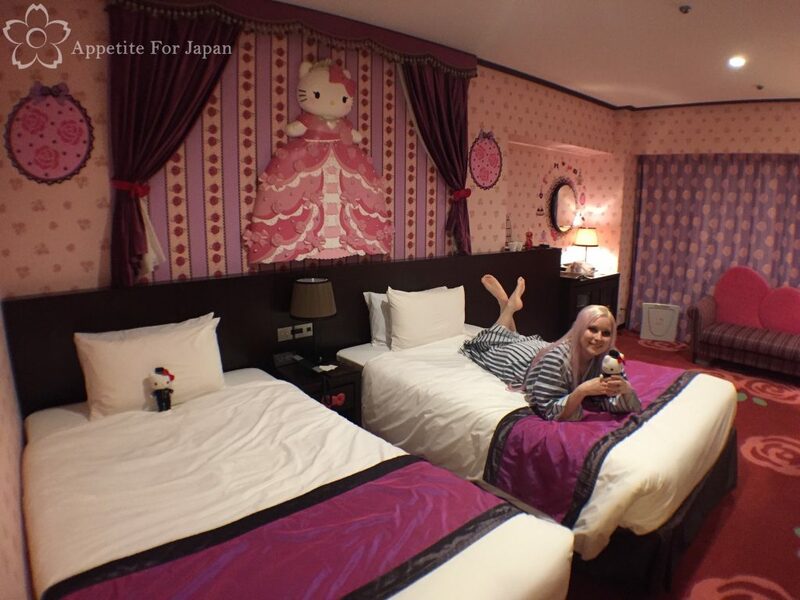 Hello Kitty rooms come all come with separate king-single beds. This is common when it comes to themed hotel rooms, and I guess it increases the number of guests who will stay there, as they’re not restricted to romantic stays. 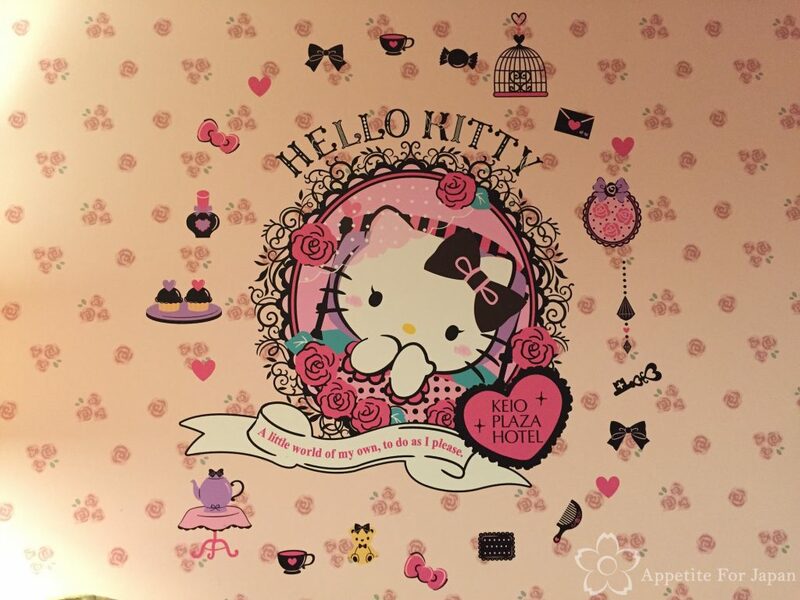 One of the (many) things I love about the Princess Kitty room is that the huge Hello Kitty on the wall above the beds is 3D – it’s not just a random decal stuck on the wall. It’s clear that a lot of effort has been put into these rooms (which is good, because they cost a lot of money to stay in!). The furniture is another impressive aspect of the Princess Kitty room. 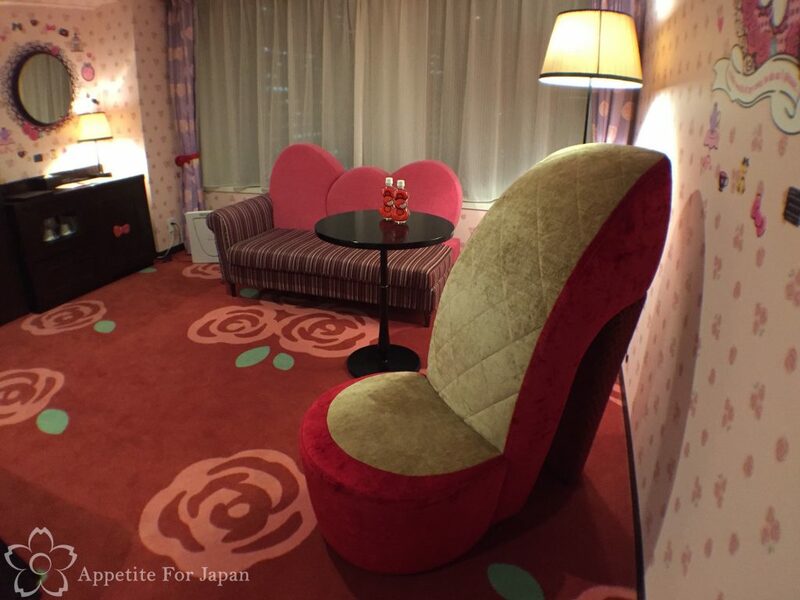 Check out the Hello Kitty bow couch, and the red and gold stiletto chair! Above: The Keio Plaza website claims that sitting on this high heel chair will bring you fortune. I’m afraid I can’t testify to that, but I can say that the shoe chair was surprisingly comfortable to sit on. 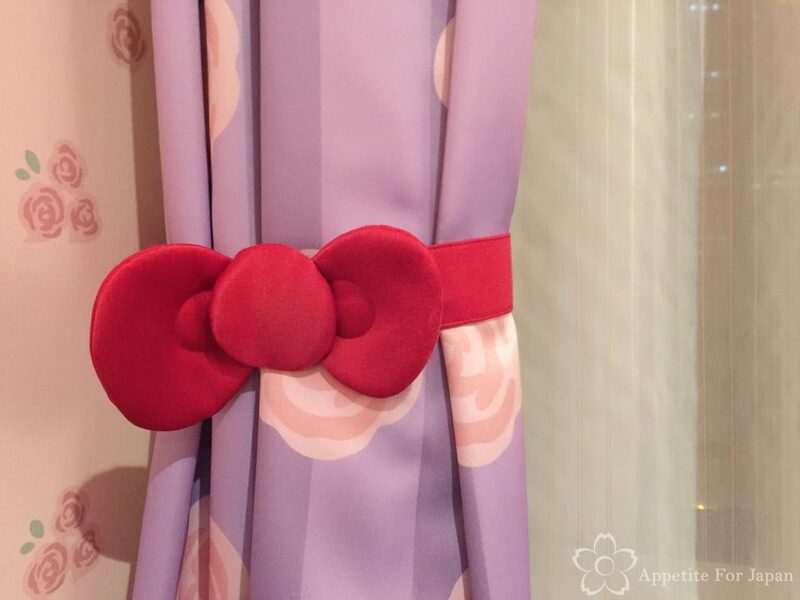 Above: Curtain ties feature Hello Kitty bows, while the curtains, wall paper and carpet all feature rose patterns. 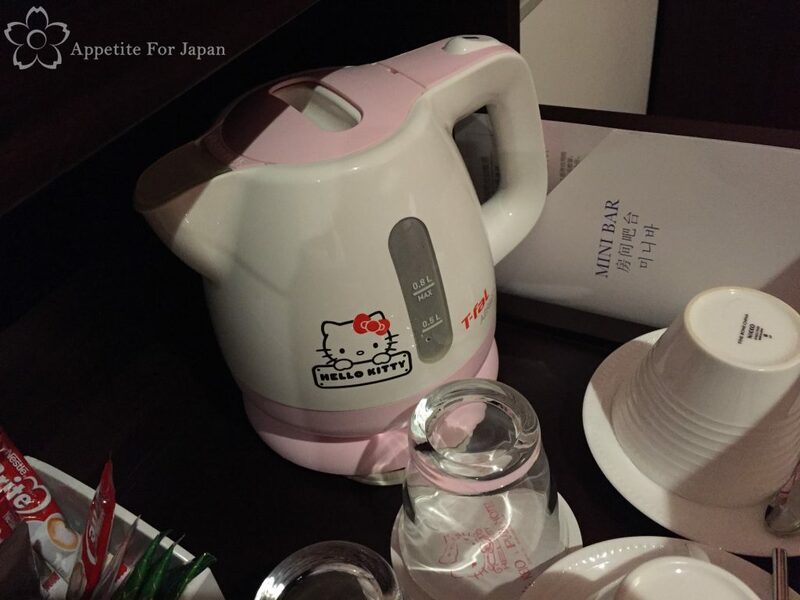 Above: Even the kettle is Hello Kitty themed. And that’s not all – there is also a Hello Kitty humidifier in the corner of the room, as well as another small machine that I think was either a dehumidifier or a heater. Above: Drawers on the dresser have Hello Kitty bows for the handles. 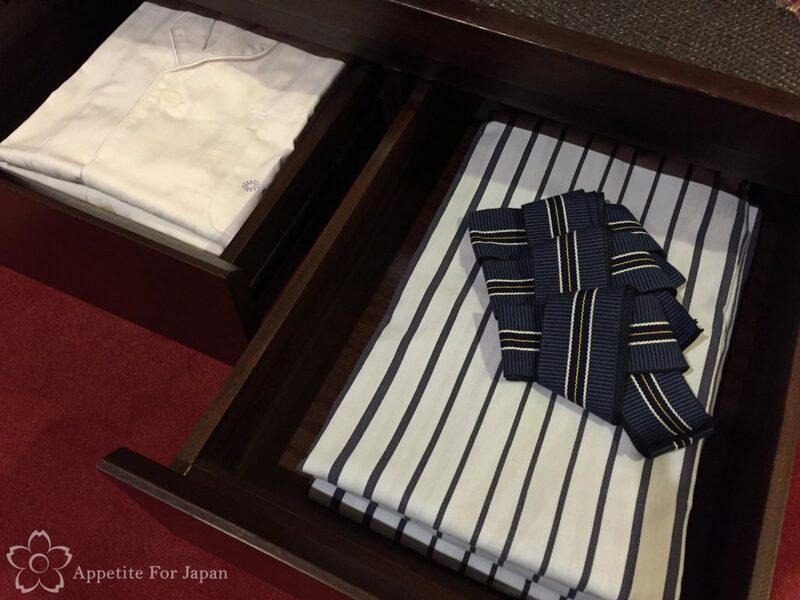 And, like many Japanese hotels, a yukata and sleeping shirts are available for guests to wear (no, you can’t take these home). 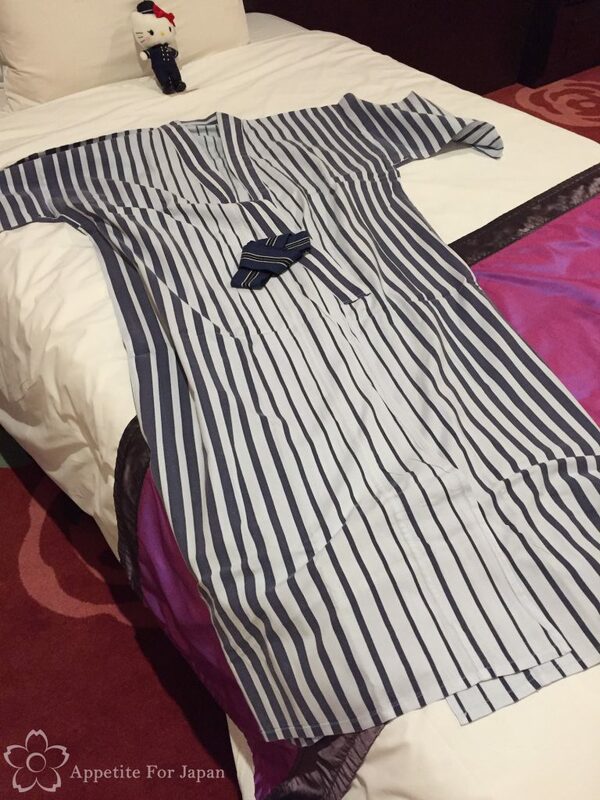 Above: A long cotton yukata. 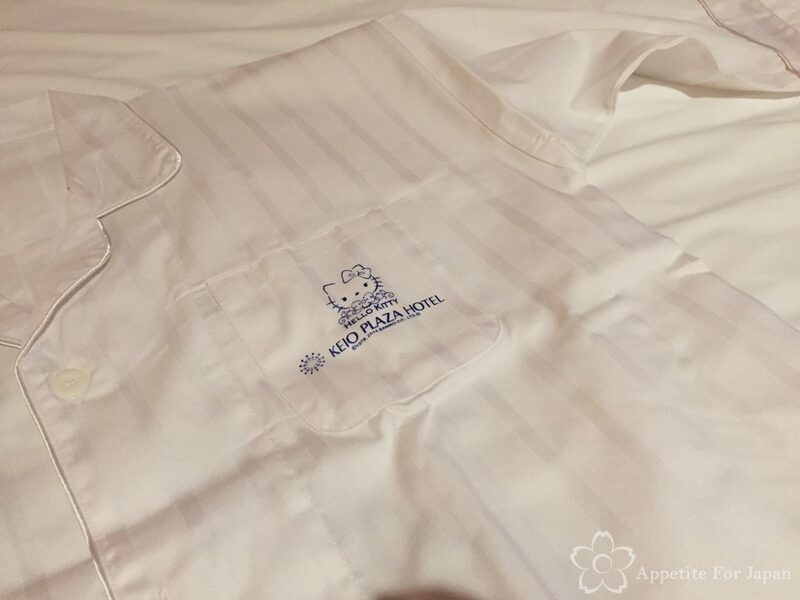 Above: The night-gown even has the Hello Kitty Keio Plaza Hotel logo on the pocket. 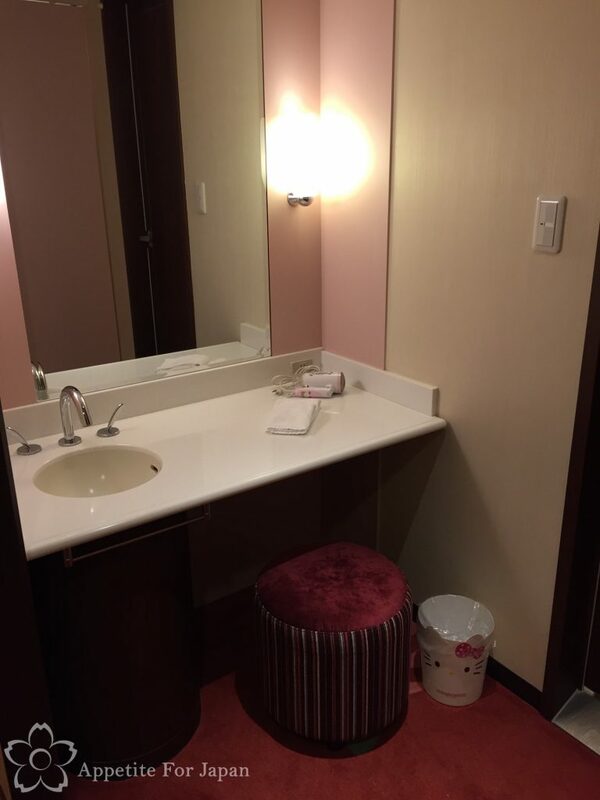 Outside the bathroom is a vanity with a basin and a hair dryer. 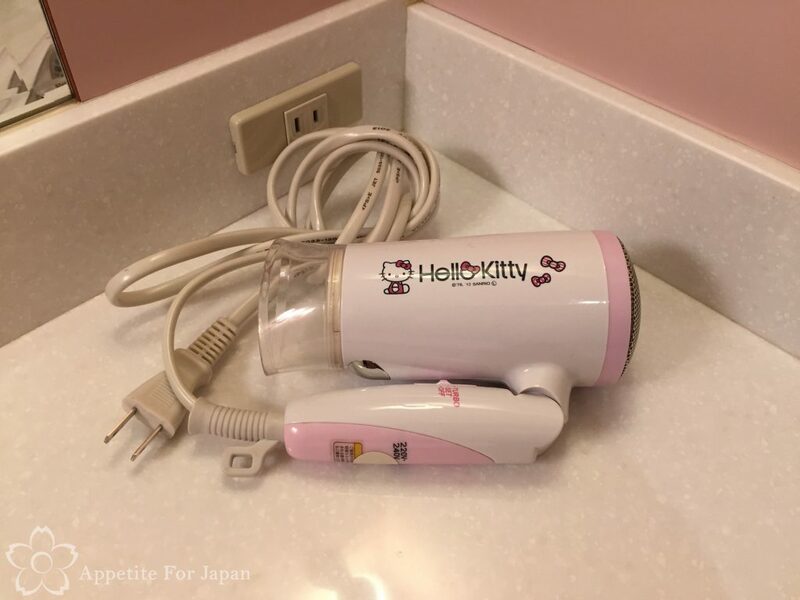 Above: Of course, it’s not just any hair dryer – it’s a Hello Kitty hair dryer! 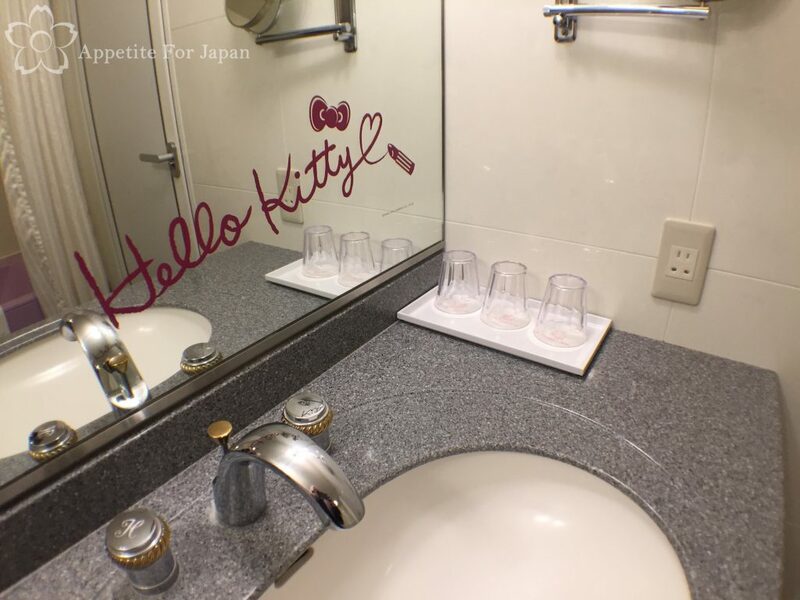 There is more Hello Kitty goodness in the bathroom, from Hello Kitty’s signature written in lipstick on the mirror, to a box of Hello Kitty skin care products, Hello Kitty coasters under the cups, and more. 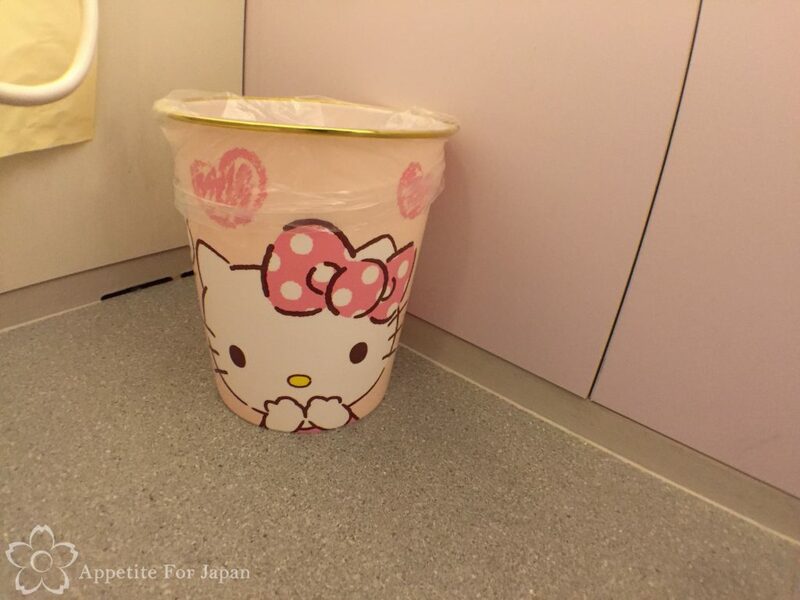 Above: One of two Hello Kitty garbage bins. 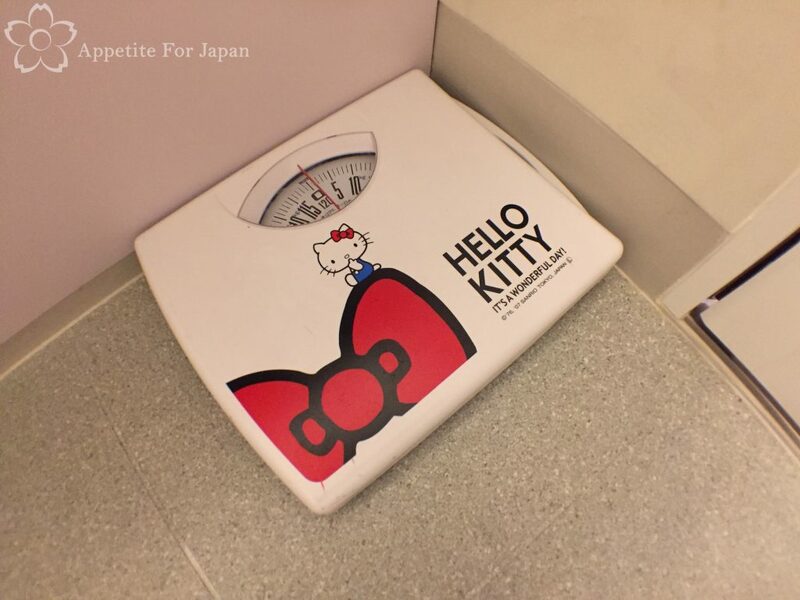 Above: After you’ve pigged out on your Hello Kitty room service breakfast, you can weigh yourself on none other than a Hello Kitty scale! Did I mention Hello Kitty room service breakfast? Read on – I’ll get to that in a little while. 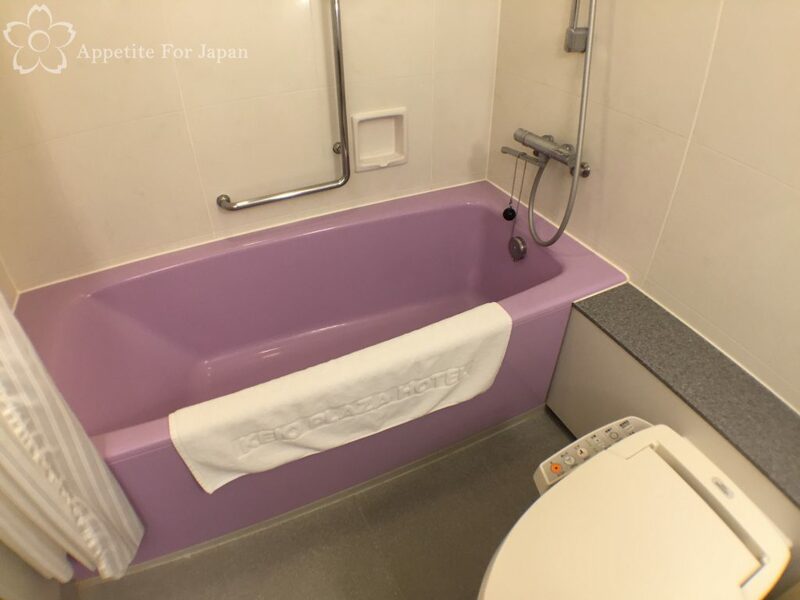 Above: The bath isn’t themed per se, but it is mauve which is rather kawaii. What Hello Kitty goodies did we get to take home? 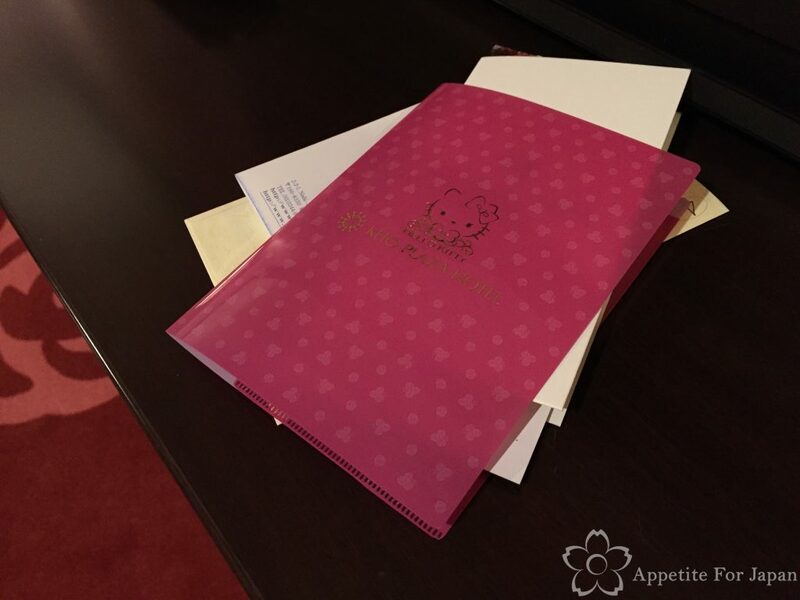 All of the paperwork comes in a neat little pink Hello Kitty folder (I think this is the ‘key book’, as they put your room key – just an ordinary hotel swipe card – in it). Easily the best item that you get to keep is the Hello Kitty doll. Each guest gets one, so if for example there are two of you in the room, you’ll both get one. 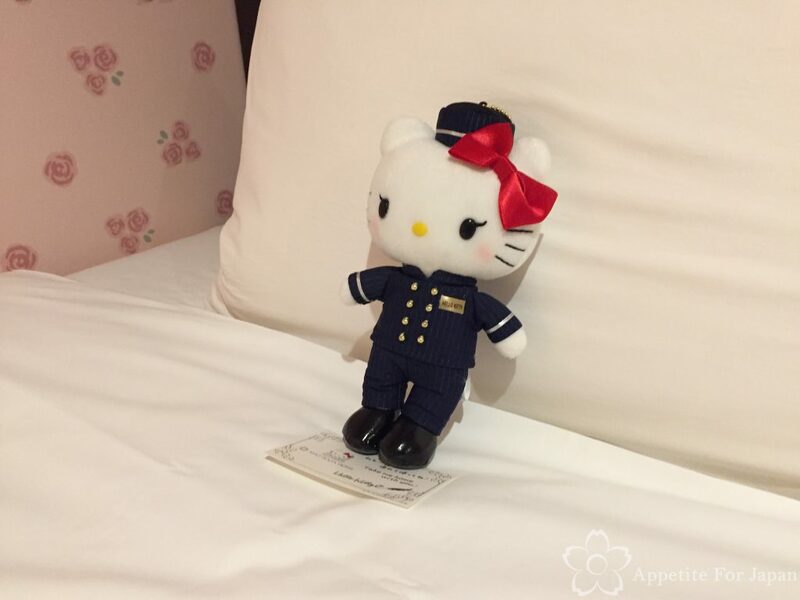 In the past the Hello Kitty dolls have worn purple dresses, but when I stayed there, they had exclusive Keio Plaza Hotel staff uniforms! 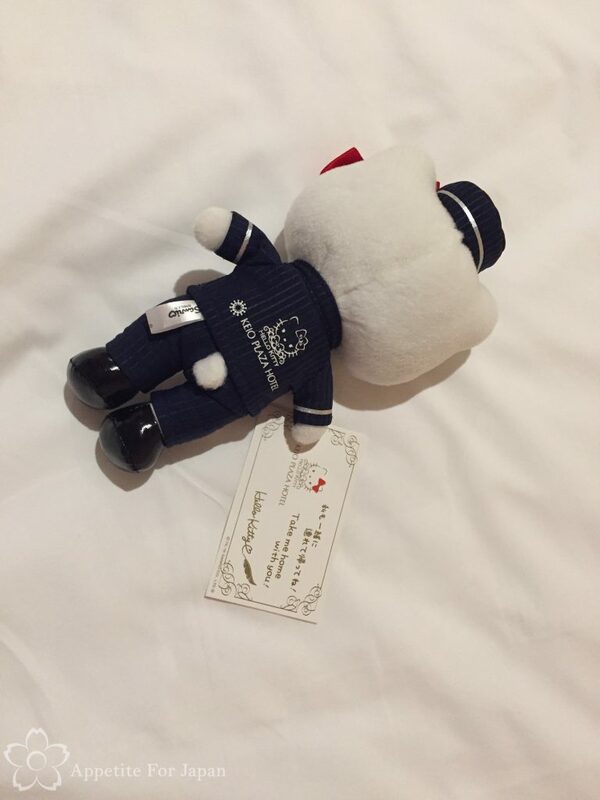 Above: They even have the Hello Kitty Keio Plaza Hotel logos on the back! 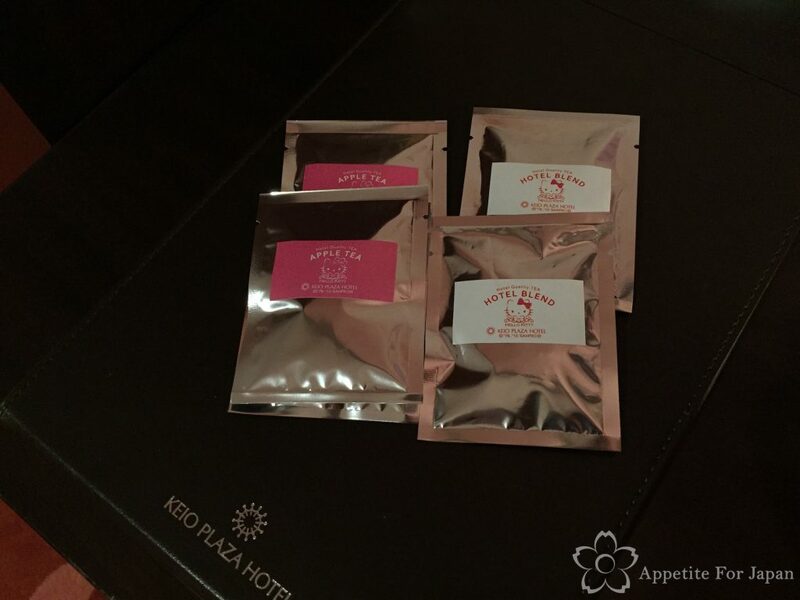 Above: Should you want to make a cup of tea with the Hello Kitty kettle, there are a couple of varieties of special Keio Plaza Hotel Hello Kitty teas – apple tea and the hotel blend. If you’re not in the mood for tea during your stay, you can take these with you. 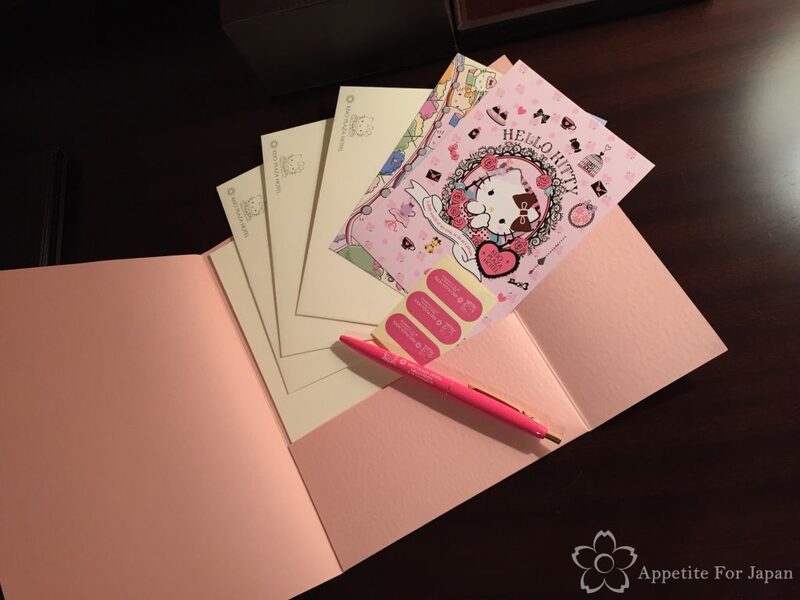 Above: A little Hello Kitty stationery set. 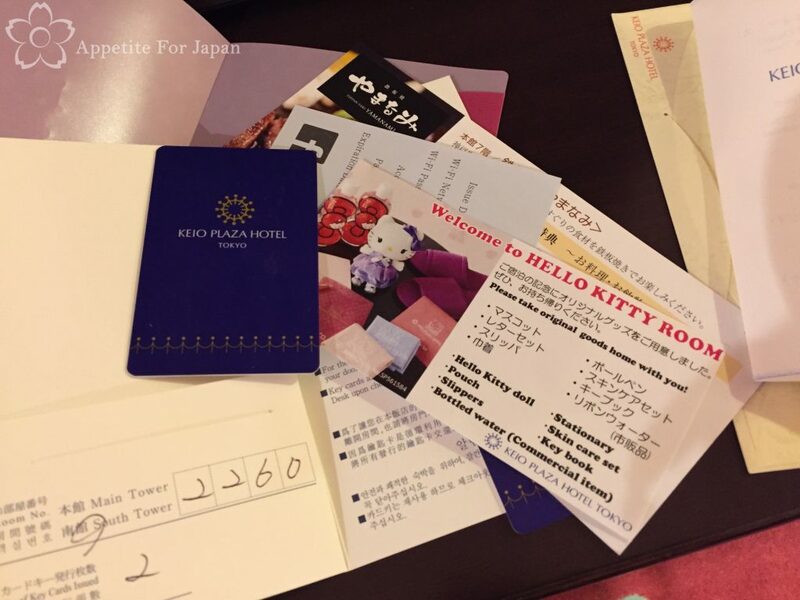 The two postcards match the themes of the rooms – Princess Kitty and Kitty Town. Above: Hello Kitty bow-shaped bottled water. 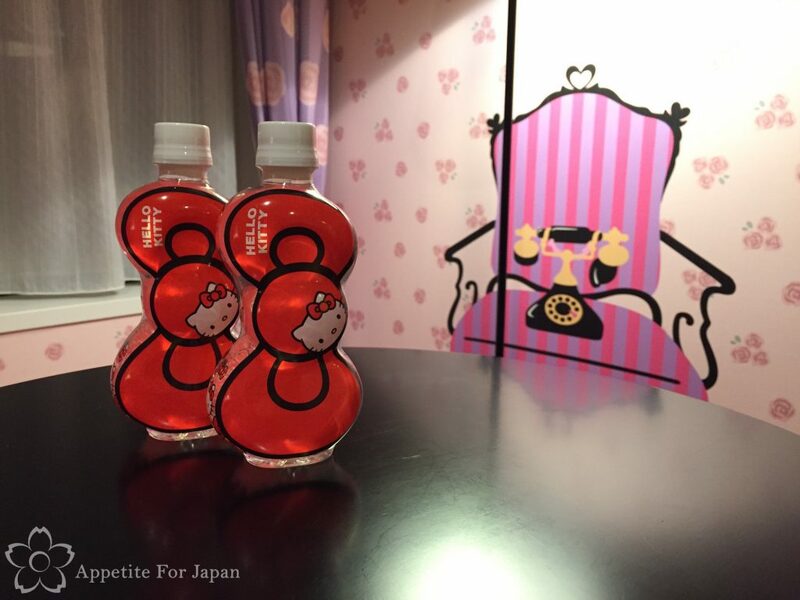 Note that these are not exclusive – you can buy these in various places, but given that many hotel rooms include bottled water, the inclusion of Hello Kitty water bottles is a nice touch. Above: Hello kitty skin care sets and small plastic pouches. Guests can feel free to raid this as they would any hotel bathroom. The other items in the box (such as the shampoo) are not Hello Kitty themed. 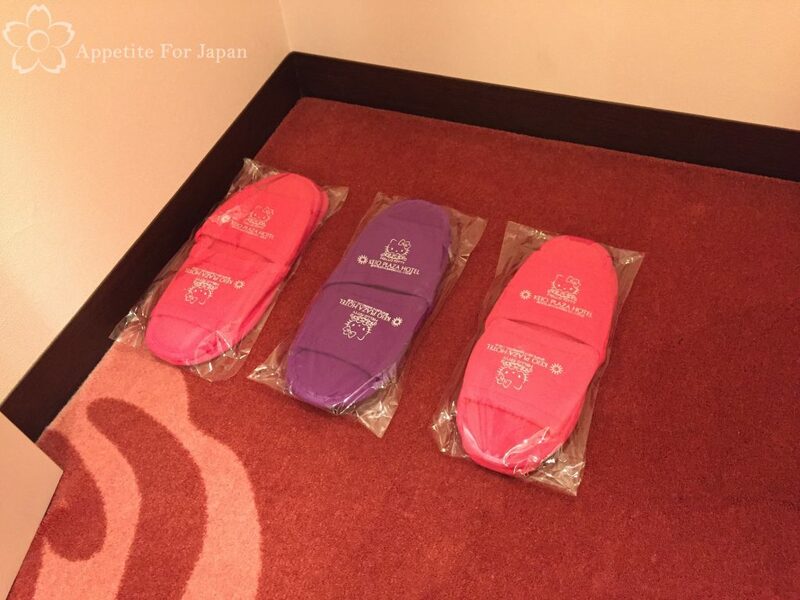 Above: Choose between hot pink or purple Hello Kitty bathroom slippers, once again with the Hello Kitty Keio Plaza Hotel logo. I love hotel room service breakfasts, so I was pretty excited about waking up to a Hello Kitty themed breakfast after a night in the Princess Kitty room! 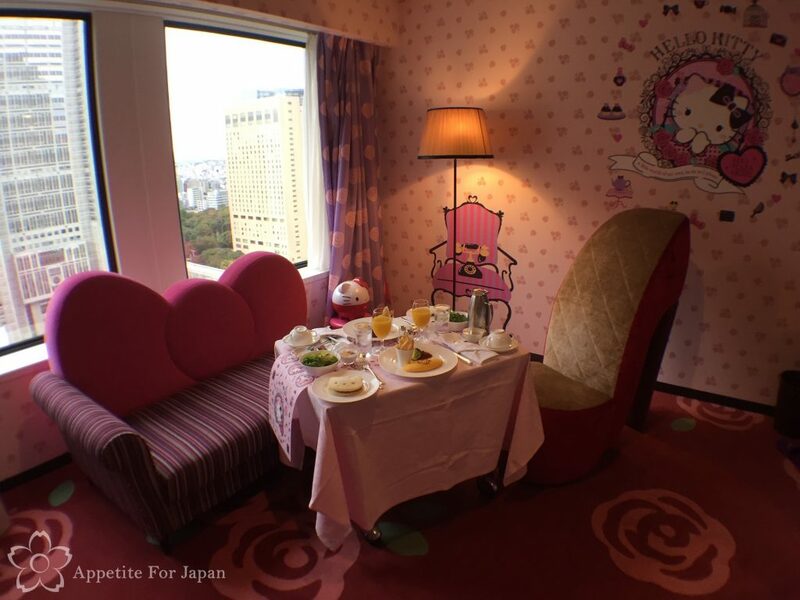 Note that you need to select the option of the Hello Kitty room service breakfast when you book your room. 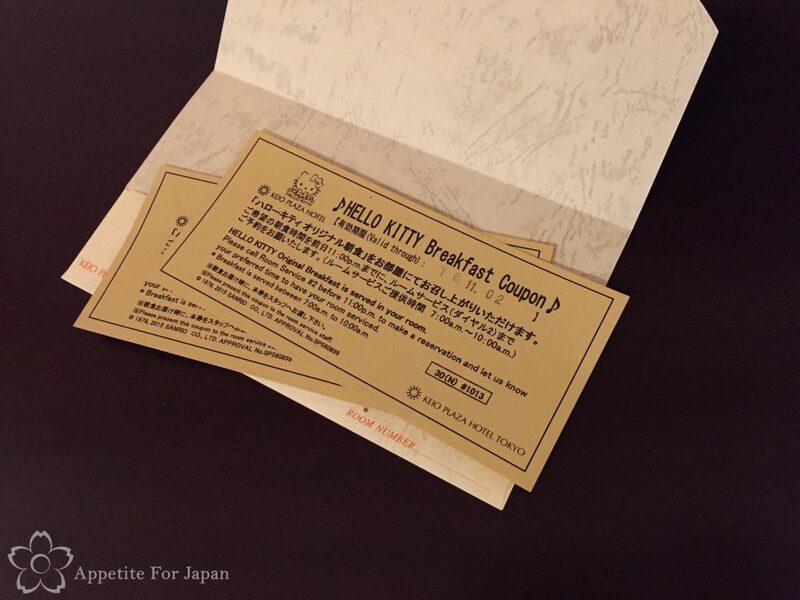 Above: They gave us these Hello Kitty breakfast coupons when we checked in, but these are really just to remind you that you need to call the Room Service desk before 11pm to confirm that you’ll be having the room service breakfast. I know, it seems odd to have to tell them that you want room service breakfast given that it’s an option that you select at the time of booking the room, BUT they love their rules in Japan, so it’s important to make that phone call. This allows you to select the time that you want your breakfast brought up, too – between 7am and 10am. 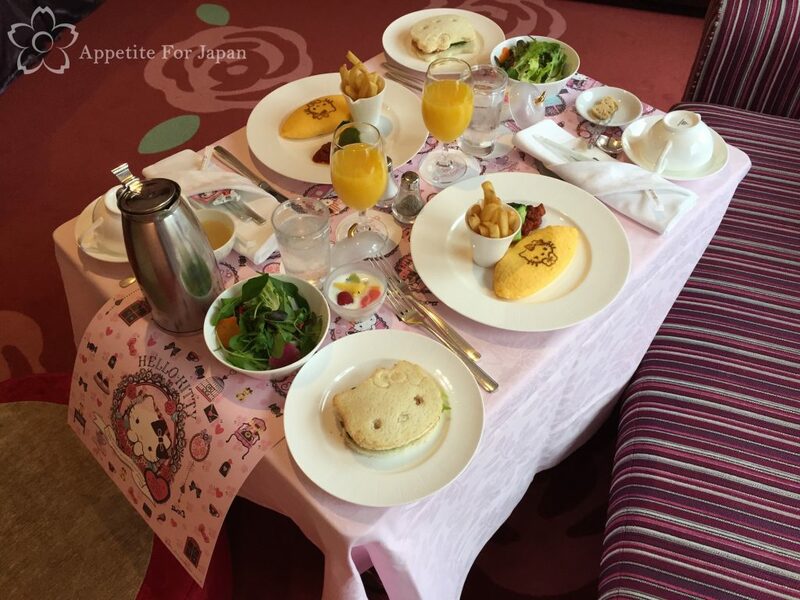 And here it is: Hello Kitty room service breakfast! The more you look at the food, the more Hello Kitty shapes you’ll find. 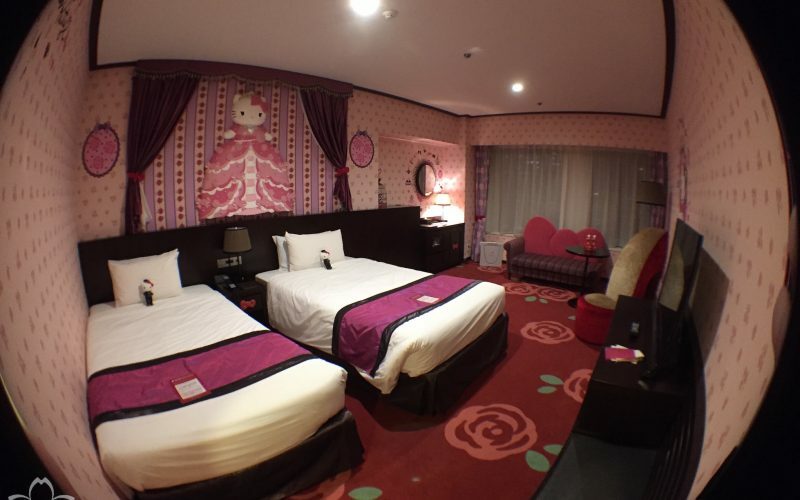 How much does it cost to stay in a Hello Kitty themed hotel room? a) Shinjuku is one of the most vibrant, happening parts of Tokyo, and you’ll almost certainly want to spend some time there, or in this general area of Tokyo. 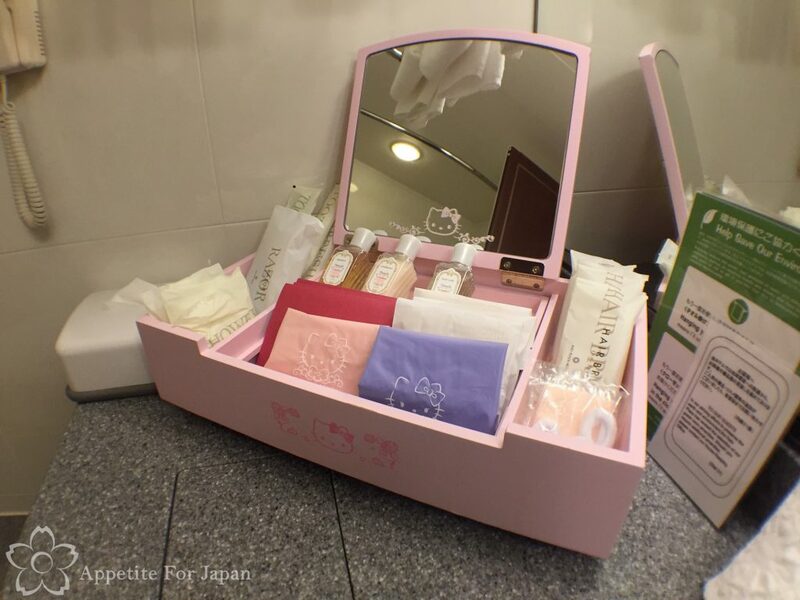 b) Princess Kitty rooms are only available at Keio Plaza Hotel Tokyo in Shinjuku. 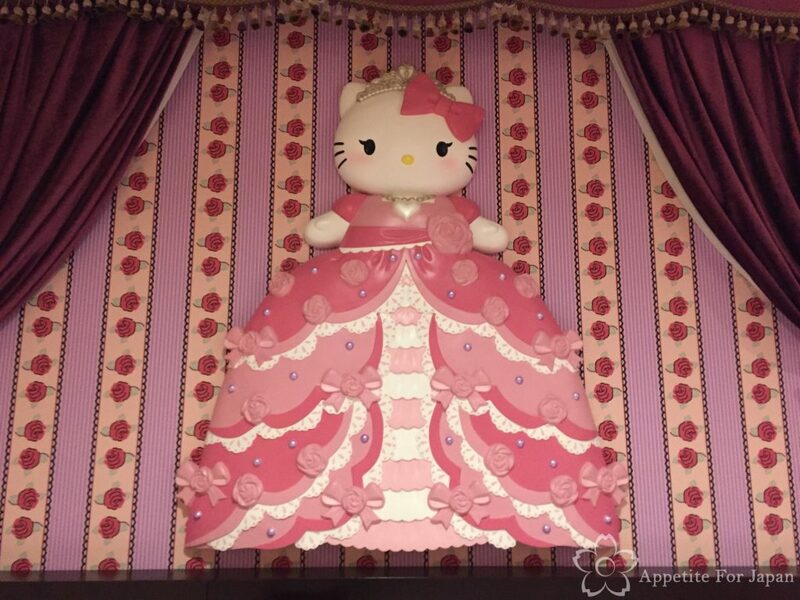 Keio Plaza Tokyo‘s Hello Kitty rooms are the same price regardless of whether you choose a Princess Kitty room or a Kitty Town room. 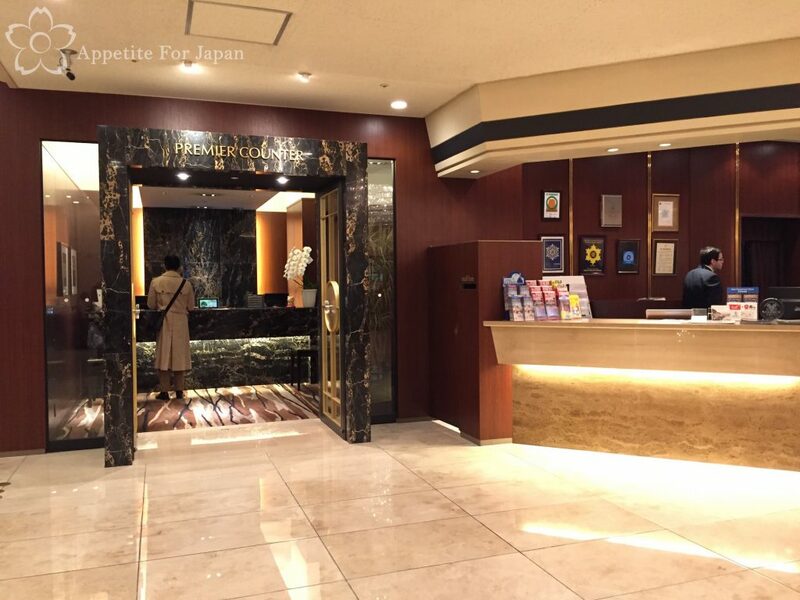 They range between approximately ¥66,528 without breakfast, to ¥74,056 including the room service breakfast, for two guests (for three guests, expect to pay more). These rates are comparable to a themed hotel room at the Tokyo Disneyland Hotel. If you’re not fussed about whether you stay in a Princess Kitty room or a Kitty Town room, then the good news is that there is a more affordable option! Keio Plaza Hotel Tama – which only has Kitty Town rooms – is significantly cheaper than the Shinjuku branch. Tama is a bit out of the way from central Tokyo, but it’s five minutes’ walk from Sanrio Puroland, so it’s a great option if you’re planning a day at Sanrio Puroland. Keio Plaza Tama‘s Kitty Town rooms, whilst smaller than the Shinjuku rooms (and possibly with different amenities and take-home goods), is decorated in the same pop-art theme. 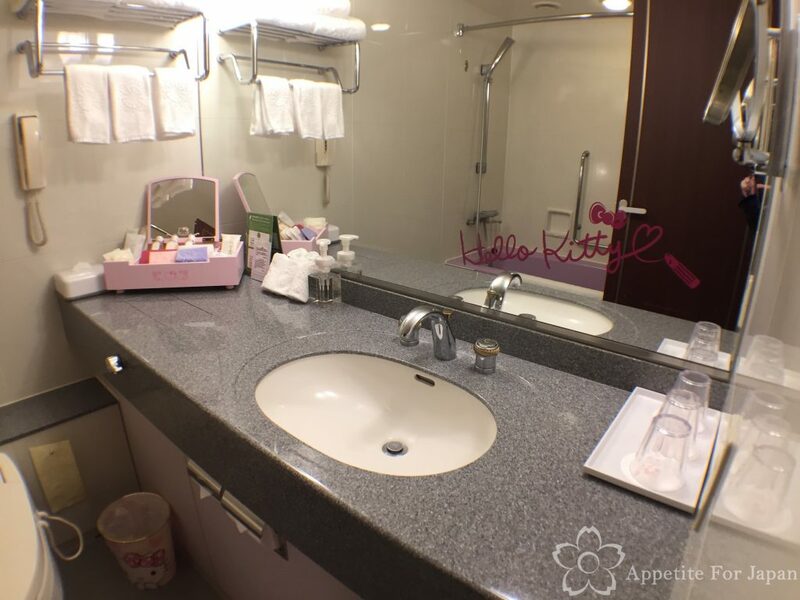 These rooms typically cost approximately ¥26,600 per night without breakfast, or between ¥29,500 and ¥48,000 (depending on the time of the week, etc) with breakfast, for two guests (again, you can expect to pay more for three guests). It is common for Japanese hotels to charge different room rates for the same room, depending on the number of guests in that room. Hence you will pay more for three guests than if there are just two of you. 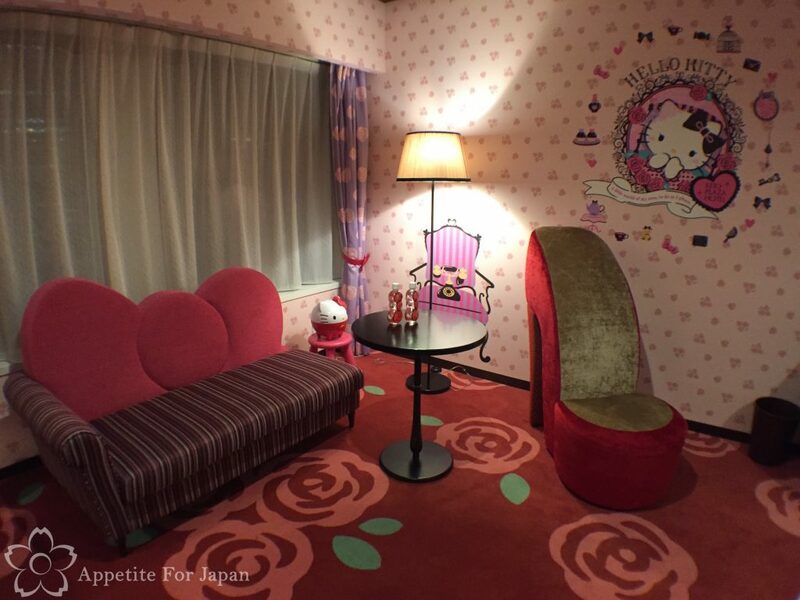 How do you book a Hello Kitty hotel room? 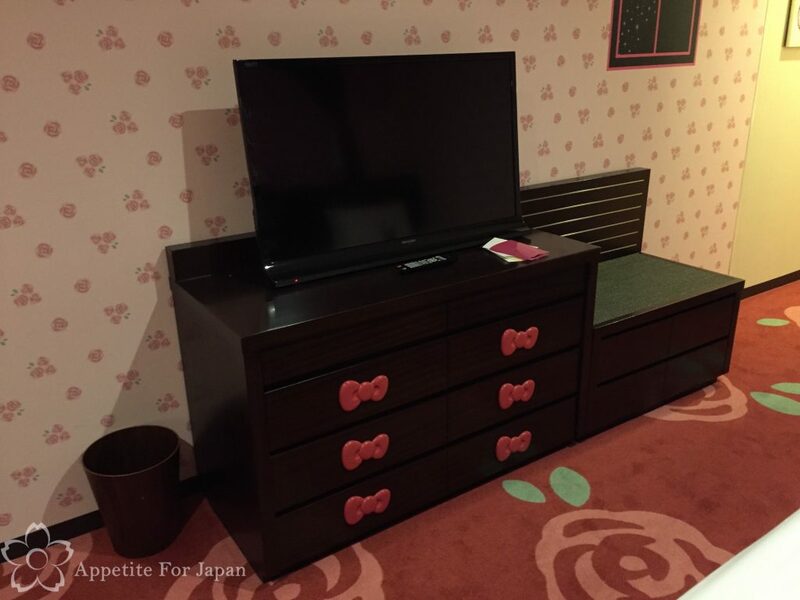 Keio Plaza Hotel’s Hello Kitty rooms can either be booked directly through the Keio Plaza website, or via a service such as Booking.com. 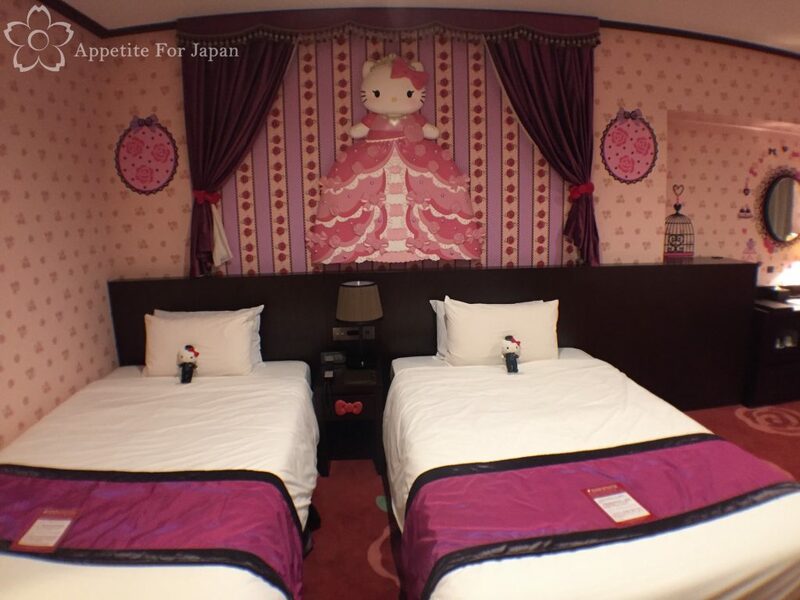 Tip: When attempting to book a Hello Kitty hotel room, you might find that all of the rooms appear to be unavailable. If you’re trying to make a reservation well into the future (say, more than two or three months in advance), this doesn’t necessarily mean that the rooms have been booked out. Keio Plaza seems to make its rooms available in batches of a few months at a time. We spent months fretting over the belief that we’d missed out on a room, only to find that they simply hadn’t made the rooms available yet! So, if you can’t see any Hello Kitty rooms available in the entire month you’re looking at, it’s worth checking again closer to the time. 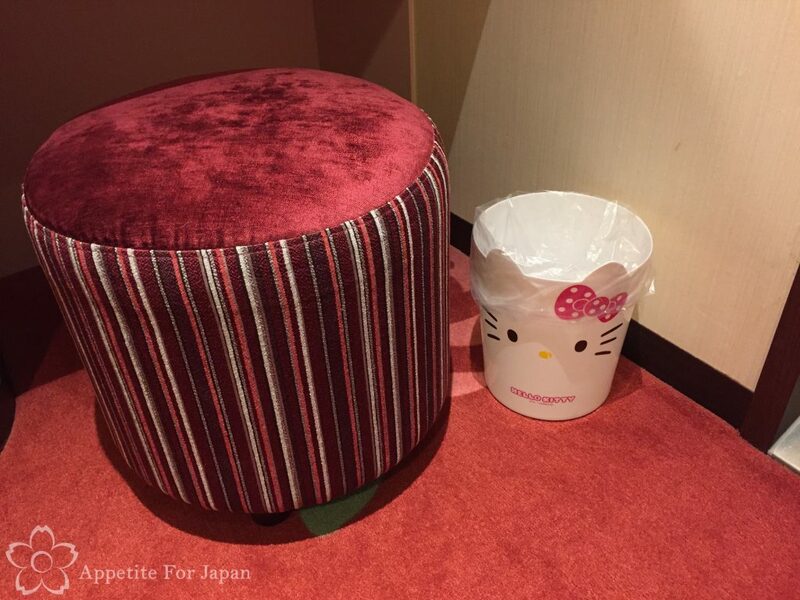 All Hello Kitty rooms at Keio Plaza Hotel are non-smoking. *Please note that these are affiliate links and I may receive a commission for bookings made via these links – I am only recommending Booking.com as this is a service that I have used many times and have been very happy with. My personal preference is to book via Booking.com, not because of my potential commission, but because you’ll often have the option of flexibility (sometimes you can get free cancellations close to the date of your stay), and because they often have discounts on hotel rooms. 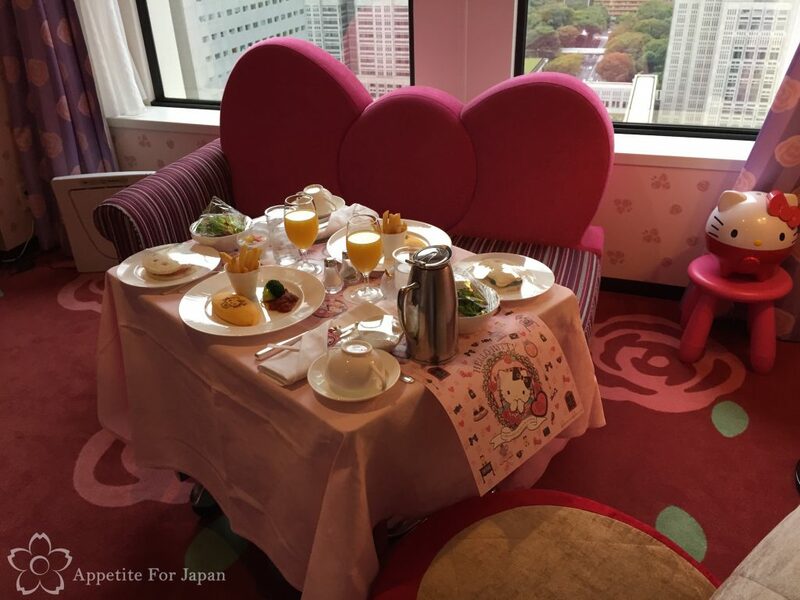 Would I recommend staying in a Hello Kitty room at Keio Plaza Hotel? 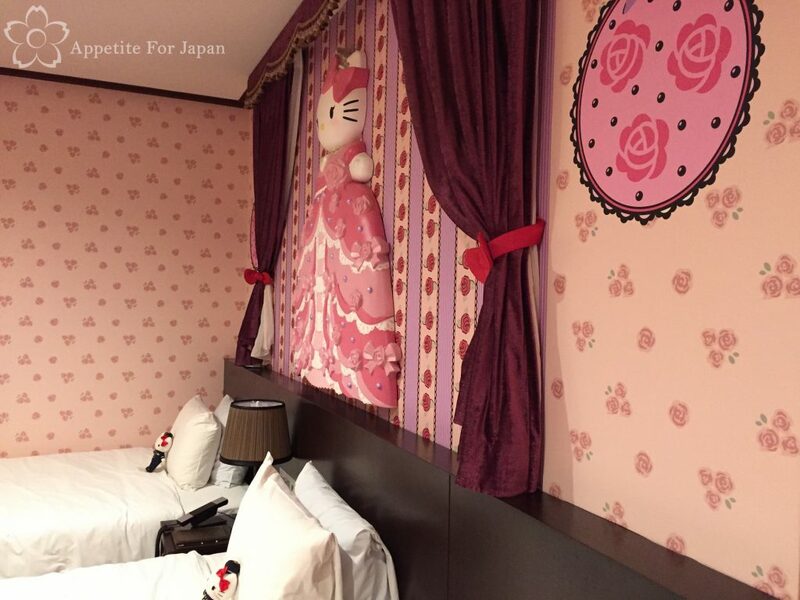 Keio Plaza Hotel’s Hello Kitty rooms are great. 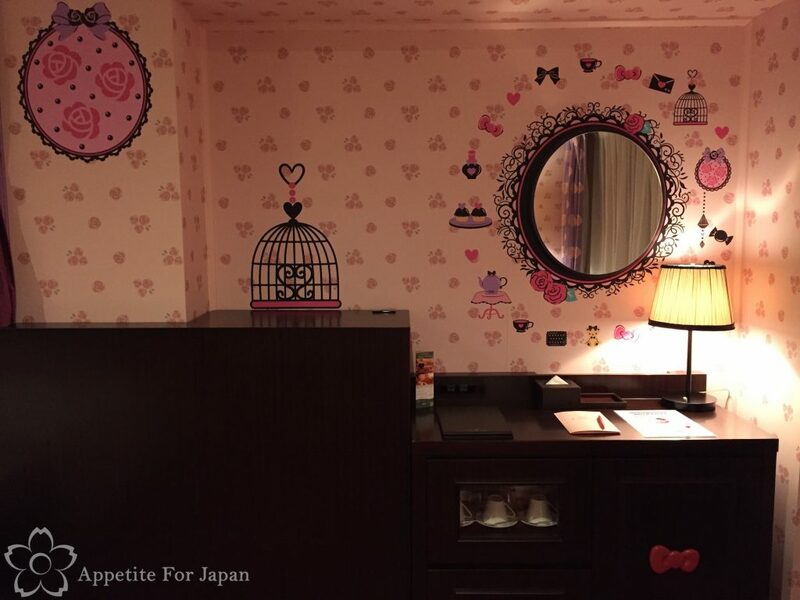 They’ve done a fantastic job of designing the rooms so that guests can immerse themselves in a world of Hello Kitty for the night. However, they are very, very expensive to stay in. This being the case, if you feel that you can afford it and you love Hello Kitty, then by all means yes, I would recommend it. If you’re trying to save money, then I’ll let you decide whether this is how you want to spend it. It was certainly fun spending a night in the Princess Kitty room, and one night was enough for me to get my Hello Kitty hotel fix! Next up we’ll pay a visit to Sanrio Puroland and check out Lady Kitty’s house.